I have always wanted to visit the British Museum in London, but that was before I knew how much the place resembled an evidence locker. Herewith I offer a vituperative rant. 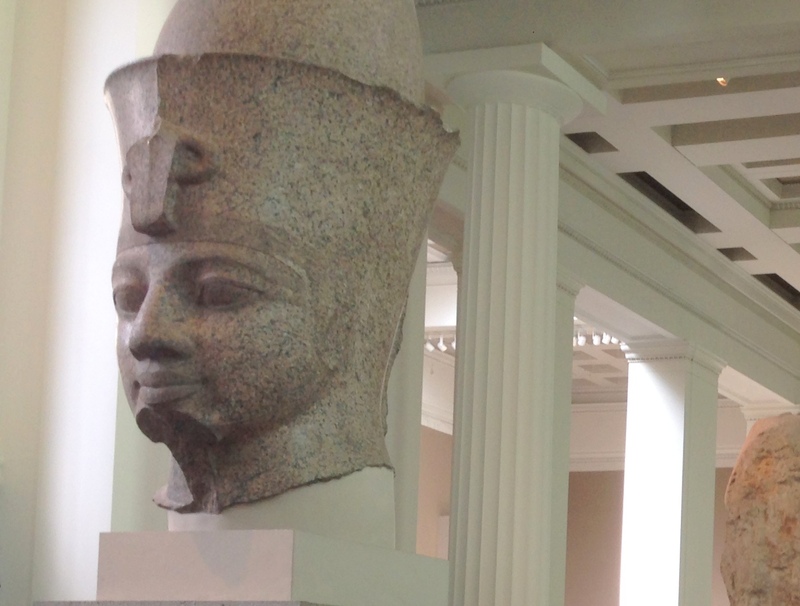 We went to the British Museum to visit a nice variety of artifacts that were missing from the Parthenon and various sites in Egypt, among other places. Perhaps the most famous of the plundered loot at the British Museum are the so-called “Elgin Marbles.” I’ve always thought this was a dumb name. I have images of Lord Elgin in his short pants kneeling over a circle in the sand shooting aggies and cat’s eyes with his kindergarten chums. But no, the “marbles” are massive marble sculptures that were removed from the Parthenon at the turn of the 19th century. Extremely dedicated readers of this blog will remember that we visited the Parthenon last year and that I suggested that perhaps it was time for the museum to give back the stuff that Elgin took. Britain claims that Elgin procured the stuff fair and square – he was given permission to appropriate the sculptures by the government in charge. The problem is that the government in charge at the time was made up of conquering Turks, not actual Greeks, and allowing Elgin to cart off Greece’s cultural heritage was the equivalent of selling Big Ben off the back of a truck. There’s a display exhibit that offers a tepid defense for the theft. First, they say that removing the sculptures protected them from damage due to poor air quality and other environmental hazards. Is the UK going to invade China and remove the Great Wall because Beijing smog is bad? Next, they say that presenting the sculptures at ground level, as they do in the museum, is better than having to stare up at them at the Parthenon. I don’t buy it. Finally, they say that having the sculptures divided between the Acropolis Museum in Athens and the British Museum in London provides visitors with multiple perspectives on the works. Please. Each one of these arguments is worse than the one before. Using their logic we should cut down Big Ben and send half of it to New York and display it on the sidewalk somewhere so everyone can see it up close. We also had the pleasure of seeing much of what was missing at the Temple of Karnak in Luxor, including the head of a decapitated sculpture whose body we visited in Egypt. Raise your hand if you don’t think the head and the body should be reunited. Oh, and we saw the Rosetta Stone. The Rosetta Stone! Give that back! We saw the headless body in Egypt. I say we reunite them. Okay, I’m done with my rant. It would be more honest if they said that they stole the stuff fair and square and they’re not giving it back, rather than insult people’s intelligence by pretending to use reason and logic. I feel better now…well…not really. On to less controversial London-area experiences. We’ve been to London many times, but we’d never ventured too far from the city center. Our daughter’s new roommate’s parents Anthony and Allison live in Cambridge (from which they both graduated), and they invited us up for an utterly charming day. (By the way, our kid is now an official New York City apartment dweller – your donations or just your pity are most welcome.) It’s only about forty five minutes from London’s King’s Cross station, but a visit to Cambridge is a trip waaaay back in time. The university dates back to 1209 and it feels like a movie set. Of course there were smart-looking students doing their thing, but there were also distinguished-looking ladies and gentlemen of a certain age wandering about, some of them even wearing robes. These folks take their education seriously. The architecture isn’t bad either. Anthony treated us to a great lunch and then walked us around campus, where he pointed out a number of the great architect Christopher Wren’s buildings, including the library at Trinity College, Anthony’s alma mater. To top it all off, there’s a charming little river running through it, and you can sit in a boat and be paddled along by a student gondolier. 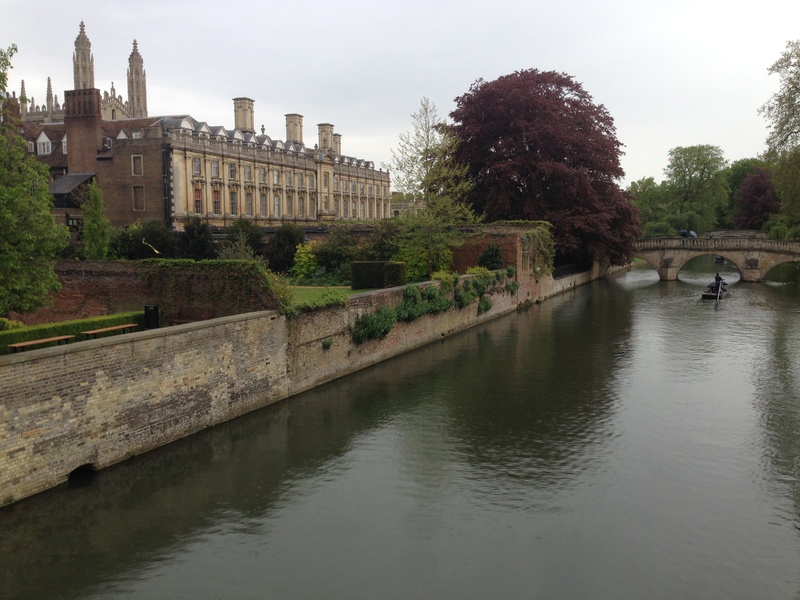 The lovely River Cam running through Cambridge. After a mid-afternoon tea shop interlude, we headed off to what’s called an “evensong” service at the extraordinary fifteenth century King’s College Chapel, in which the program was almost entirely sung. It was kind of like an ecclesiastical Les Miz. Actually, it was like the kid’s version, because there was a choir of prepubescent boys, sounding like dozens of pan flutes, rising seven stories up into the largest fan vault cathedral in the world. Zamfir would be proud. This may be the thing I like best about England – it’s so very English, and it’s old but functional. You can wander into a three hundred year-old pub, a six hundred year-old chapel, or an eight hundred year-old university and my guess is that a time traveler wouldn’t get lost. If they would just give every else’s old stuff back, the place would be damn near perfect.